“Anne asked if we would like to walk up Mount Teide when we go to Tenerife”, reported Ian coming off the phone to his sister. Adding, “She says it’s a long walk rather than a climb”. 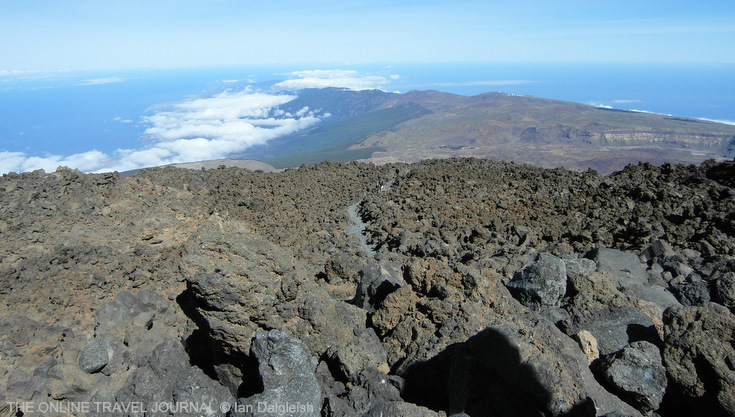 I’m a bit iffy with heights (or more to the point, drops) but to stand on top of a volcano …. that would be special. Having said yes I looked up Mount Teide. At 3718m El Teide volcano in the Canary Islands is Spain’s highest mountain; the third highest volcano in the world and the highest point above sea level on any Atlantic island. Finding a few more hills to hike up and getting in some longer walks before arriving in Tenerife seemed prudent if I was going to make the most of the experience. For sailors the sight of Teide’s distinctive cone seemingly floating on clouds has long heralded a landfall in the Canary Islands. Up in the air we were on the wrong side of the plane for a view coming in to land at Tenerife South airport but over the next few days from our first stop on the neighbouring island of La Gomera every so often we’d catch a glimpse of Teide rising into clear skies above the clouds. I felt a tad in awe, was I really going to stand up there ? Whether you take the easy way up by cable car or walk to the base of the summit a bit of planning is needed if you want to go right to the top as a permit is required to climb the last 160 or so metres. 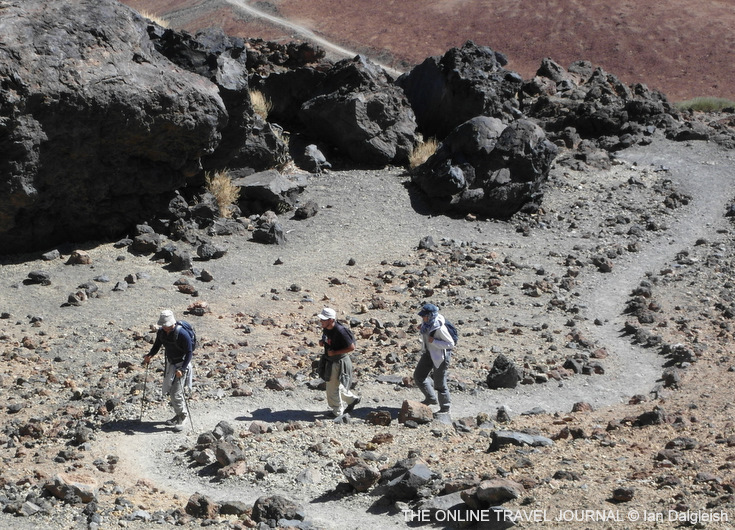 Teide and the surrounding area was designated a National Park in 1954 and given UNESCO World Heritage status in 2007. Permits are free and available online from the National Parks website up to 2pm the day before you want to go but as part of the management plan numbers are restricted, so it’s best not to leave booking until the last minute. You have to chose a time slot, there are four, two hour slots starting at nine in the morning. We had the last one from 3 – 5 pm (more owls than larks in our party). We were lucky with the weather waking on our day to clear skies. “ There’s the objective”, said brother-in-law Terry pointing from the apartment veranda to Teide in the distance – it still looked a long way up. 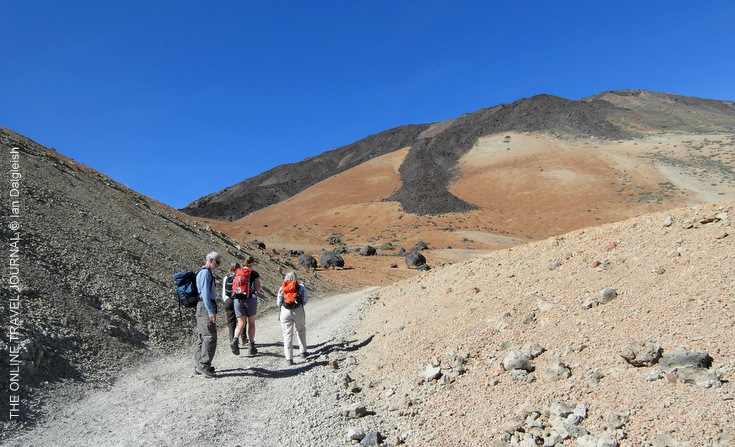 Our starting point for the walk was about an hour away beside the TF-21 road that runs through Teide National Park. Driving inland we left behind the arid landscape of the southern coast climbing up through mountain villages into pine forests. 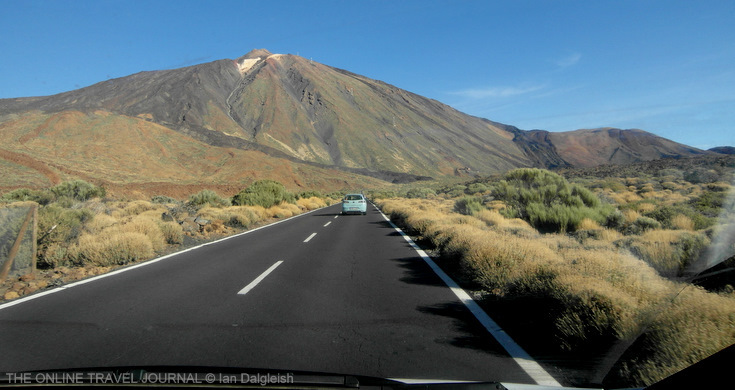 Then suddenly, it seemed, rounding a corner we had passed through the crater walls into the eye-opening volcanic landscape of Las Cañadas caldera, El Teide rising from the plain to crown the scene. Looking back on the walk it falls into four sections. The first part took us along this broad track that curves then snakes steadily upwards around the eastern side of Montana Blanca (the White Mountain). You can just just catch a glimpse of its light, if not quite white, coloured dome above the lava flow and to the right of Teide. 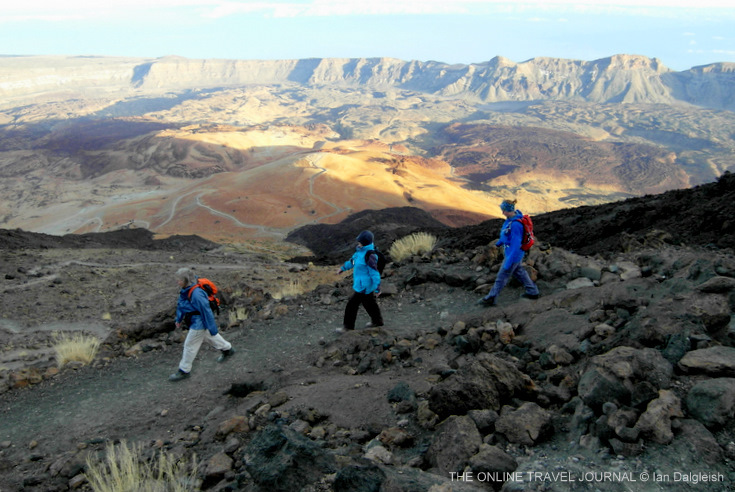 Setting off … I had imagined the landscape would be greyer and was a surprised to find volcanic debris in earthy shades from off white through fawn and rich chocolate browns to almost black – startling to look at with the colours intensified under clear blue skies. 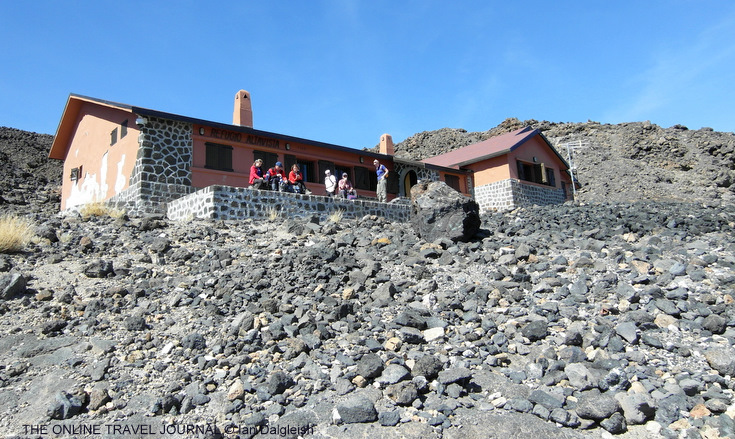 Teide Eggs and Lava Flows …. Higher up we came to the Teide Eggs( Huevos del Teide) . These massive boulders; lumps of lava flung from the volcano in past eruptions to snowball down its slopes, lay scattered as if giants with no aim have been playing boule. And reaching out down the mountain great tongues of black lava still giving the feeling of coming to get you even turned to rock. It’s something between awe inspiring and scary, contemplating the massive forces that created this chaotic landscape. Kylie atop a Teide Egg gives an idea of their size. Looking back the views were marvellous. By this point we’d been walking for maybe an hour and a bit – hot, thirsty work already. I wouldn’t want to try this in the blazing heat of a Canarian summer. Below us the path winds through Teide Eggs and in the distance are La Fortaleza cliffs on the edge of crater with the north coast of Tenerife beyond. 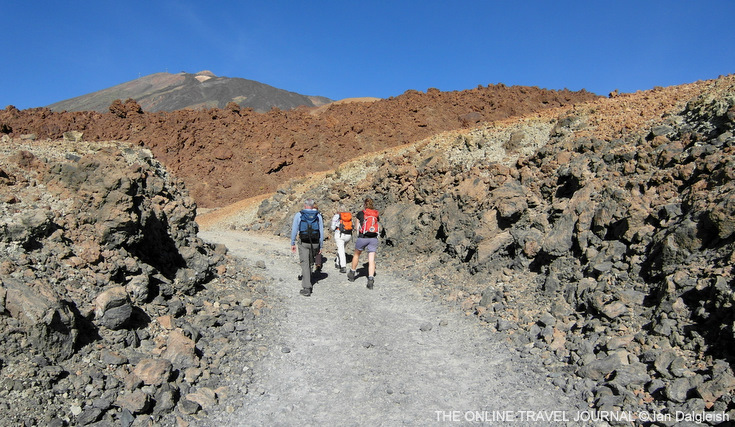 Easy part over the next stage, up the flank of Teide, was far steeper zig-zagging to and fro up a narrow, stony path. The bends made convenient targets for a pause to catch breath and have a sip of water – I was glad of Anne & Terry’s experience in ensuring we were carrying an ample supply. We were almost upon the Altavista Refuge before it came into view. In early afternoon the refuge was closed off, apart from access to toilets and a vending machine. 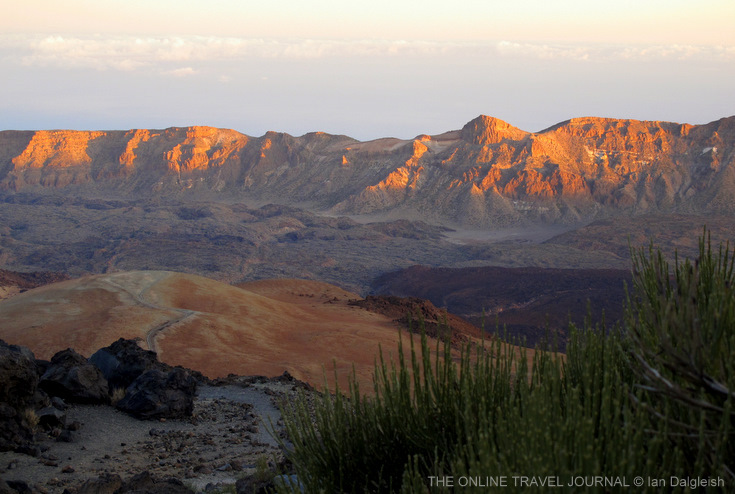 Open all year round, it’s a popular place to stay over for the experience of a Teide sunrise – visits are limited to one night. Above the refuge the path lead on less steeply through this field of rough knobbly lava, sharp enough to cut if you grabbed hold of it to steady yourself. It was getting cooler with the odd very small patch of snow to be seen nestling in shadow, this in late October. There’s an ice cave around-about here but with an eye on our time slot, we didn’t detour. By now there were fewer people on the trail so a swelling of numbers ahead signalled we had arrived at La Rambletta path leading from the upper cable car station to viewing points. The final stage … After the sights of the walk so far the summit, when it came into view, looked rather dull. Permit in order and passports showed we set off for the top on the stirringly named named Telesforo Bravo Trail accompanied by whiffs of sulphur. Teide slumbers. The summit didn’t look far but took about 40 minutes reach with increasingly frequent stops to catch breath at this altitude. On the summit …. Skirting the edge of Teide’s own crater on the final few steps I suddenly realized there was no more mountain to lean into and felt a bit of a wobble but wow, just look at the view. On top of the world, or so it felt. Above the clouds looking across the western end of Tenerife to La Gomera in distance. ” Anyone for the cable car?”, Terry asked. No, we’d got to the top, finishing under our own power would be part of the satisfaction . Definitely time for more layers though with a bit of breeze on the shady side of the mountain. Below us the path to top of Montana Blanca and our route to left are clearly visible. Photographers could do with all round vision. Ian did well spotting Teide’s shadow in the sky as we were having to spend most of the time watching our feet on the loose stony path to avoid a tumble. Tired but glad I’d said yes to a walk up Teide, this was a fitting view to end the day. 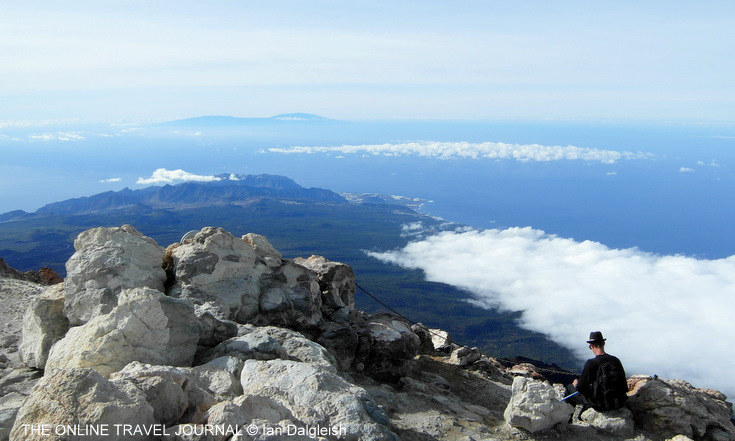 Have you been up Mt Teide, by foot or cable car – how did you find it? Hi, nice article and photos We read it and decided that it would be great to repeat your trip maybe you could sugest how to find starting point for the walk? Is it difficult? And where to leave car? Hi Monika, Glad you liked the article, it’s a really interesting place to walk. 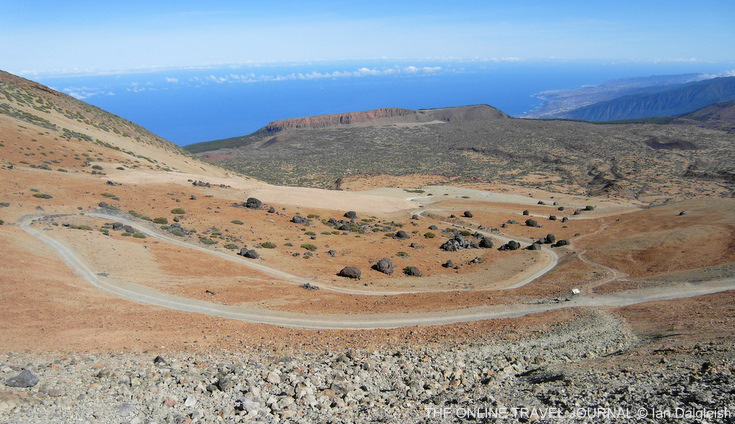 To get to the starting point, travelling eastward on the TF-21 road that crosses Parque Nacional del Teide you go past the turning for the cable car (on your left), the 4×4 track we started on, is about 2km further on, on the left. There’s a parking space for a number of cars there. Also an information board showing the route with advice. Is it difficult? It’s a long day’s walk, people reckon on it taking around 5 hours to the top, less coming back down which fits with our experience. It’s not technically difficult, but quite steep when you leave the 4×4 path heading up to the refuge and at the higher levels the altitude might affect you. April – June, October (the time we went) and November are advised as the best months to do the walk avoiding the heat of the summer and winter snow and ice. I reckon if you’re used to walking and reasonably fit you can enjoy it. The permit which you need to get in advance to go beyond the upper cable car station to the summit is available from the central reservation site for Spain’s National Parks which also has more information and advice on being prepared for the walk. Hope this info is helpful – I was really glad to have made the walk and hope you enjoy yours.